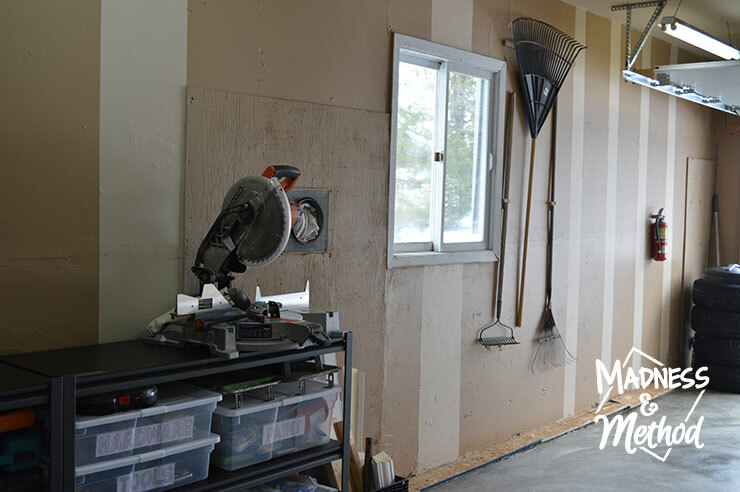 I’m thankful we had an extra week for this One Room Challenge, because we definitely were not ready for the garage makeover reveal last week – check it out! Whoopee we’ve reached the final week for the One Room Challenge (extended by an extra week, just this one time!) 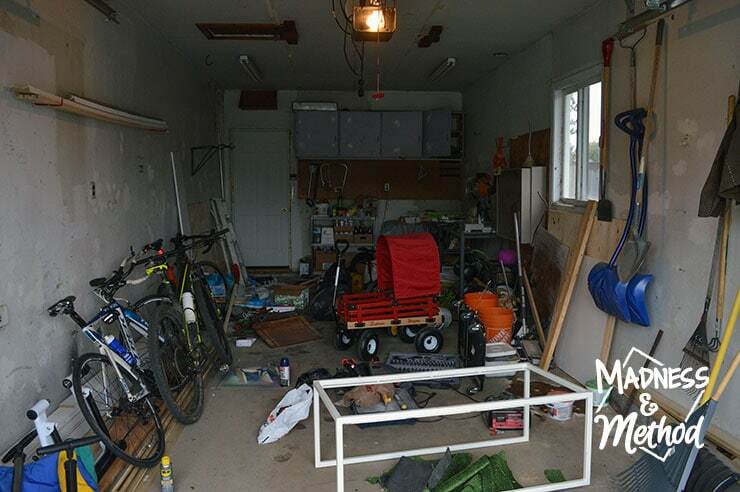 and that means that we HAVE FINISHED the garage makeover! 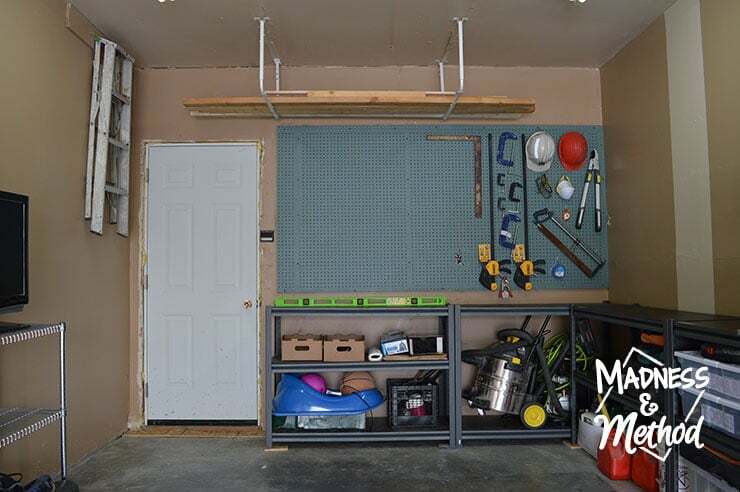 Okay, technically there are still a couple of small tidbits that aren’t done, but they don’t really affect this garage makeover reveal – so let’s just pretend everything is 100% perfect :) Let’s dive in! 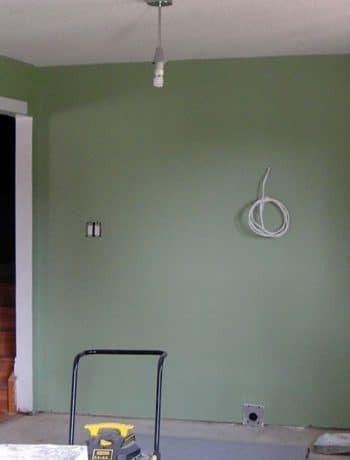 We completed this makeover as part of the One Room Challenge hosted by Linda of Calling it Home. The 20 featured bloggers reveal their rooms on Wednesday this week, and me and all the other linking participants get to share our stuff on Thursday. There’s room to park my car again! Yay! On Thursday night, the Husband was all like “I’m going to park my boat in the garage all weekend okay?”. And I calmly told him that would not be a good idea. And by calmly, I mean angrily of course, because HOW WAS I SUPPOSED TO FINISH PAINTING AND THE ENTIRE MAKEOVER WHILE WORKING AROUND A BOAT!? We compromised and he only left it in overnight and some of Friday (it was like -25° out… and someone forgot to get it ready for winter…). Continuing on this wall, we have the Husband’s “bike zone” or “pain cave” as people call it. Apparently you can search #paincave on Instagram and people show off all their bike setups. This is one area that will be changing from what you see here, since I just guessed where the Husband wanted everything. He also took his bike with him to work this week, so just pretend there’s a bike on that rack – ha! I’m super excited that our overhead storage rack came in! Shipping was estimated as November 17th, but we ended up getting it late Friday afternoon, so the Husband and my Papa installed it over the weekend – and it totally works! (I did buy two just in case, but one seems to work perfectly). I call this first shelf on the bottom the “fun shelf” because it houses our balls, baby sled and camping gear. Above that we have our “bags and bottles”, as eventually those empty boxes will be filled with bottles we need to return. Then there’s the shop vac (that I stuffed in there) and the compressor to the right. We had the one shelf already, and were able to get a matching one for the other side. I brought out even more stuff than we had before, and we still have some empty space left. I was super excited to organize everything and fill up new clear bins, and I just taped on some simple paper labels. I also organized my cut wood into a little crate, so now I can easily grab something if I need a small piece. We don’t have the new heater installed yet, but we’re hoping that the new one will go where the old one is (for now I just stuffed the exhaust hole with a rag). 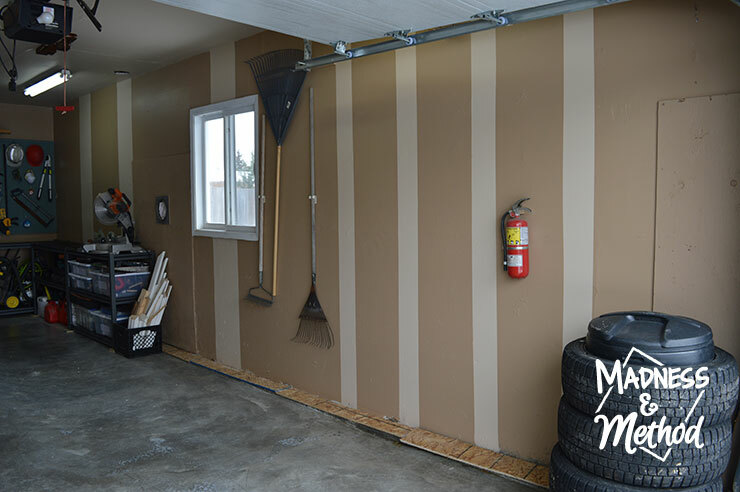 Then we have our “rake rack” as I call it, some more fun stripes down the wall, and finally a pile of tires. No, those aren’t going to be there forever (they belong on my car!) but the Husband hasn’t installed them yet. I already moved them from the other side of the garage, and it was a lot of work! I think we might have our garbage bin here instead, and once my summer tires are off, we’ll be hauling those to the shed. The door is not really lined up with the wall, so it wasn’t as simple as adding a casing to the edge (I will have to build out some areas a bit). The Husband was in charge of the heater, and he did some research and got a few quotes. 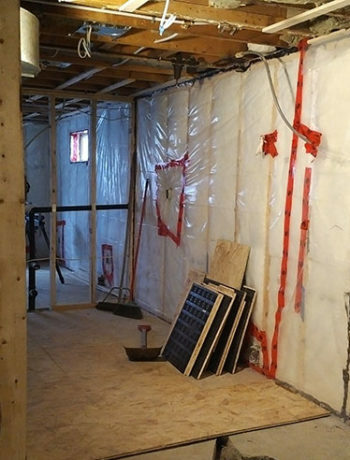 We’re pretty sure we’re going with a natural gas wall-mount (in the old location as before), so we’ll need to get our gas line moved out to the garage, get it setup, whatever. Problem is, now that winter’s hit our area, everyone’s kind of busy! 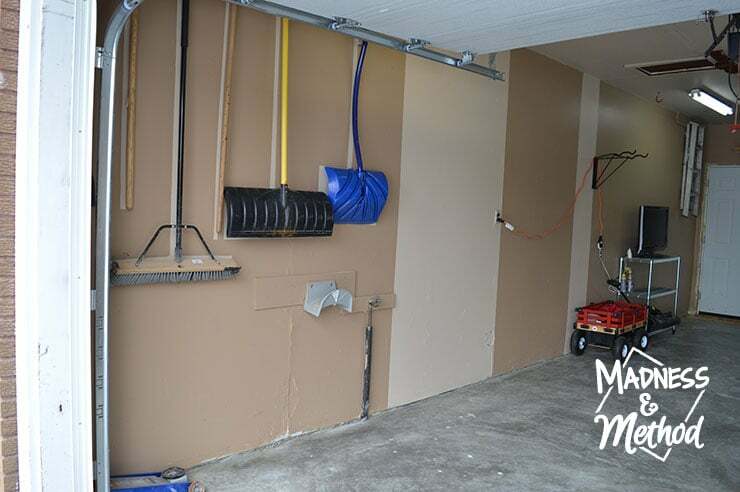 SOME MORE GARAGE MAKEOVER PHOTOS! 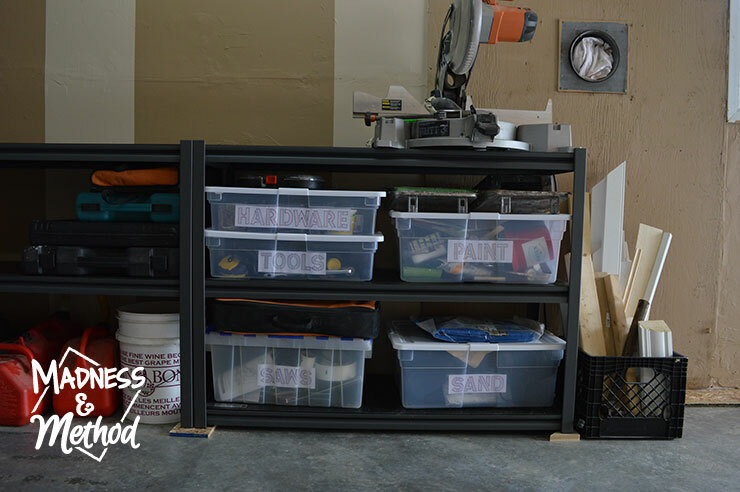 Remember the cute tool storage I was talking about? Once I got everything placed how I wanted, I simply taped around the outlines and painted the silhouettes using the light/ceiling beige. My grandpa had something similar at his house, except he just did the outlines in pencil. It’s easy to see what’s missing this way! Oh, but I literally just realized this morning that we were missing our spade! Someone left it outside, so I’ll have to find a spot and add it in. I’m most excited about our my new work zone. Having my 2x4s in here (rather than in the shed) will be much better when I want to build something in the middle of winter (and don’t have to dig through a few feet of snow). 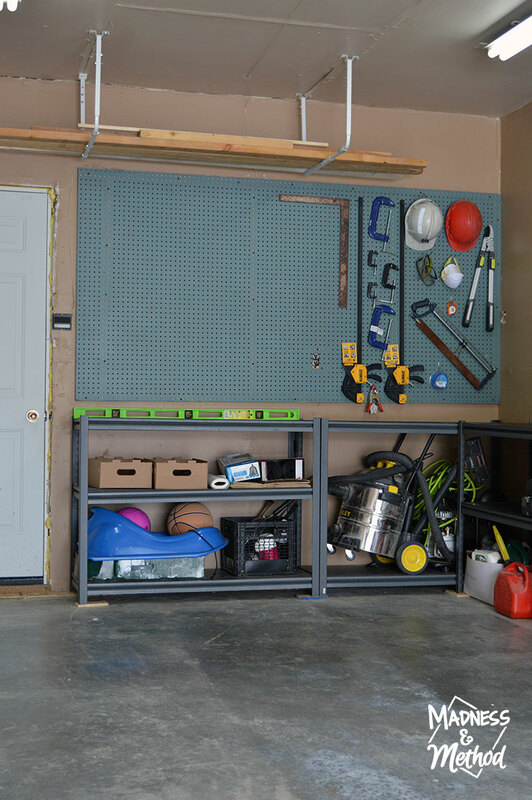 I enjoyed organizing everything, and I had to think hard about what I wanted to include on our pegboard, versus what I wanted to store in a bin. I felt like we always move clamps around, so thought these would be great for the pegboard. I also wanted our “safety gear” to be super easy to find and grab, so there’d be no excuses not to be safe while working! 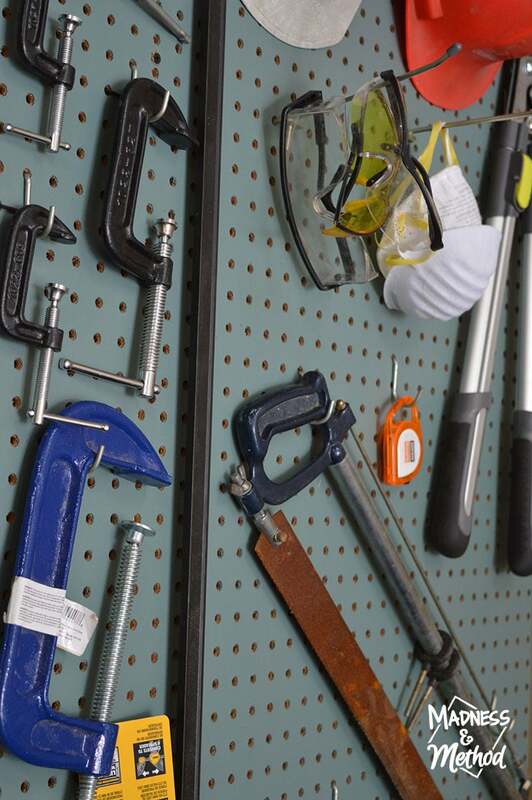 And, you probably noticed that only half of our pegboard is used up. I like that we still have a ton of space that we could potentially use, and I didn’t even have to buy more peg hooks yet! 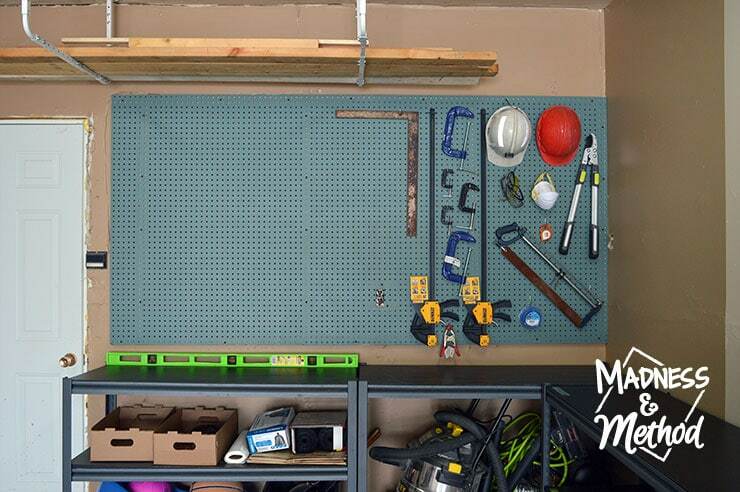 (I bought a multi-pack when we built our BBQ pegboard last summer. 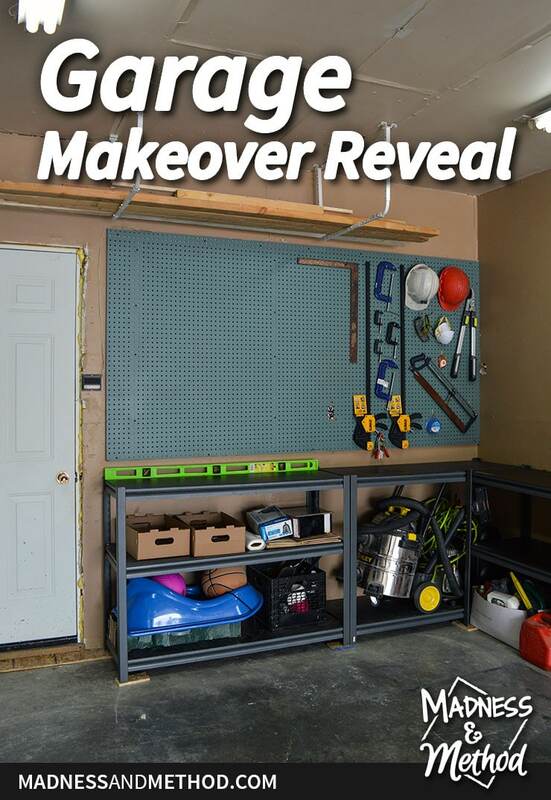 I’m thankful we had an extra week for this makeover, because we definitely were not ready for the garage makeover reveal last week! I’m sure if we didn’t start two weeks late, we would have been done on time, but considering this was a last-minute room choice, it is what it is! (And yes, I am pregnant so that explains the lethargy of the first couple of weeks – as soon as I was in the second trimester, I got all my energy back!). Unfortunately my due date is right in the middle of the next One Room Challenge, so I’ll definitely be doing the room ahead of time. Although I hate when people cheat and pretend they are doing their ORC in “real-time” (but complete it early), I may still linkup after the fact (but will still post everything here as it happens!). Make sure to check out all the great featured makeover reveals on Wednesday AND all the linking bloggers on Thursday. Sign up for the Madness and Method newsletter! I am a Multimedia Content Designer and Blogger that is in love with everything to do with houses and homes. Check out the About Page for more details about me and this website. 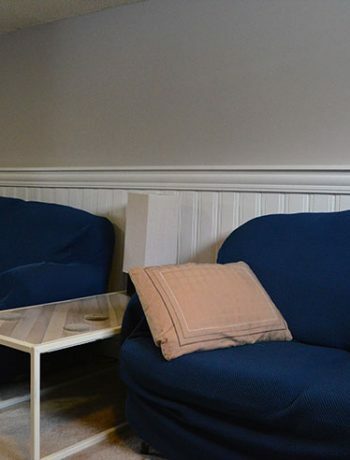 Patch, Prime, Paint: The 3 Ps of Wall Installs! Looks great .. 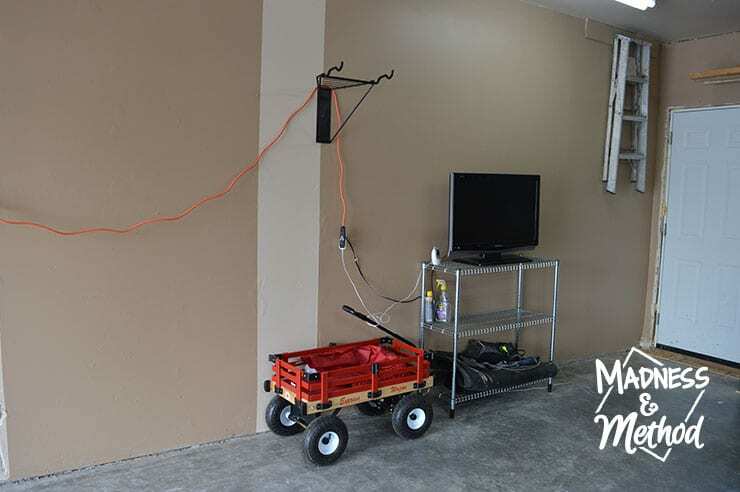 I could use your other overhead storage rack for my Christmas gift if you have not returned it yet . WOw! Fantastic organization skills! I think painting where the tools should go is genius! Congrats and Cheers to us for another room done! This is one amazing garage! The organization is genius! Yes!! 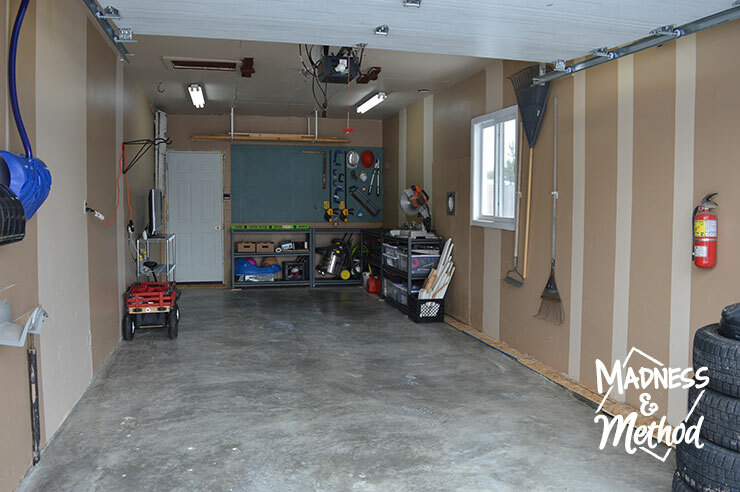 We made it and what a transformation you gave this garage! Congrats on a successful ORC – it was fun watching your progress! Great job Nicole! I wish my garage looked like this : ). 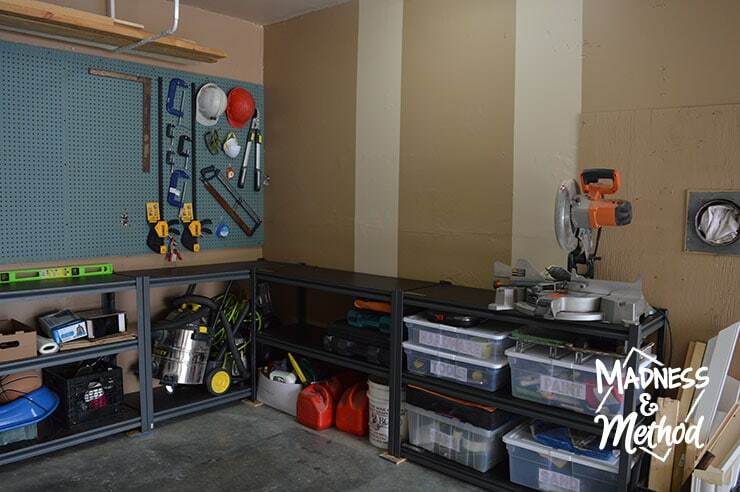 I love how you painted designated spots for the tools…I think I might steal that idea…brilliant! Well done Nicole! 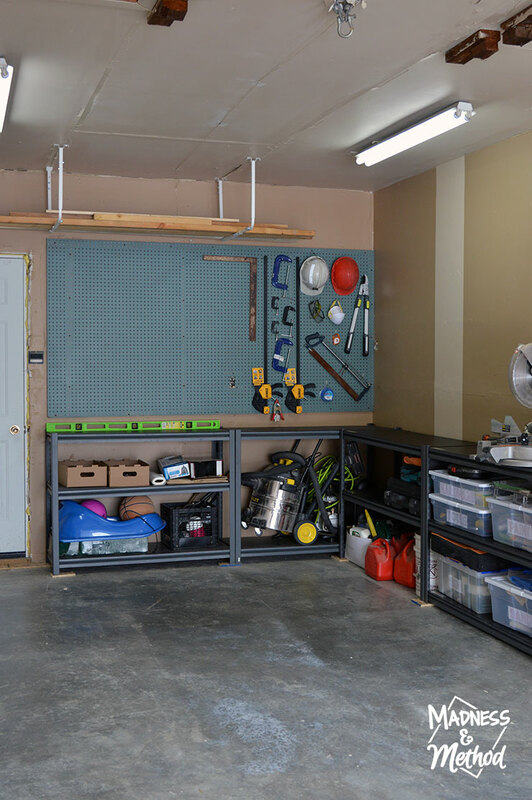 The garage is one of those dreaded spaces that everyone know they need to clean up and oragnize but noone wants to do it! You did a great job of organizing that space! 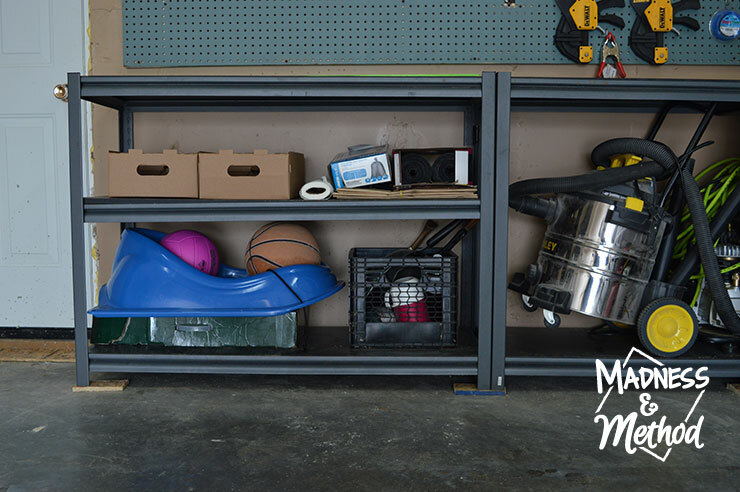 It’s funny, because now that our garage is cleaned and organized, some of our other areas are tidier too! The painted spots for the tools is such a GREAT IDEA!!! 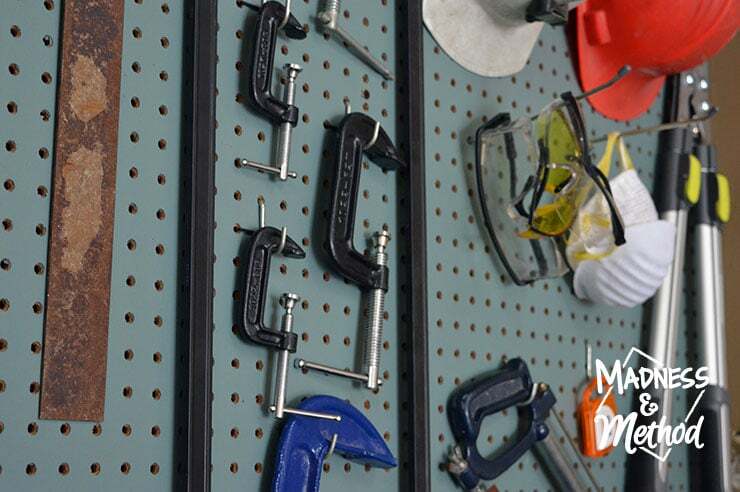 I dream of my tools one day being nice and organized like this. Great job!!! It looks fantastic! Everything is so nice and organized! I don’t know about you, but I’m glad it’s done and over. :) Great job!! Yep, happy to be done :) Now for everything else to be organized! See the About Page for more info!